We had a great opportunity to introduce L to live theater last week. The Lion King was playing at Miller Auditorium. She has never actually seen The Lion King movie but it’s a Disney movie so we thought she’d love the musical. The one draw back to the show was the length. J and I have been to several shows so the almost three hour run time was expected. L isn’t used to sitting that long. When we asked if she liked it, she kept saying “It was really long.” Once we said we just wouldn’t take her to another show if she didn’t like the length, she changed her tune and said it was fine. She really enjoyed herself. We walked out of miller about 10:00. That’s really late for all of us anymore. We were all pretty hungry when we left the theater and L asked if we could get something to eat. We had discussed going to McDonalds but J came up with an even better idea. We headed back towards Drake Road and pulled in to Drake Plaza which is where the second Kalamazoo location of Two Fellas Grill opened up a few months ago (they also have one in West Lafayette, IN). 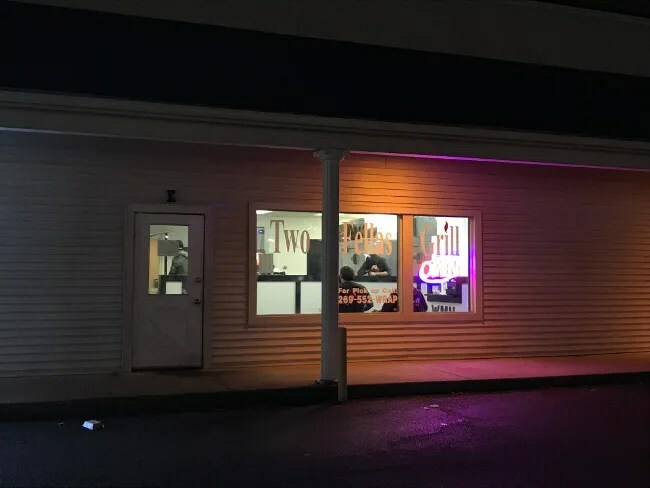 According to a Western Herald article, the original idea was just to use the space as a kitchen for take-out orders but they acquired the space behind them as well and decided to make it another walk-in option as well. This was kind of a spur of the moment thing for us so we had to go in and order. We could have just called in an order to make it quicker but we hadn’t planned on getting food on the way home. The walk-in space is just that. There are no tables. There’s just a small bench to sit and wait at although a couple of guys were sitting there eating their wraps as we walked in. There is a large chest high counter that sections off the kitchen from the small waiting area. At the end of the counter is the order area. 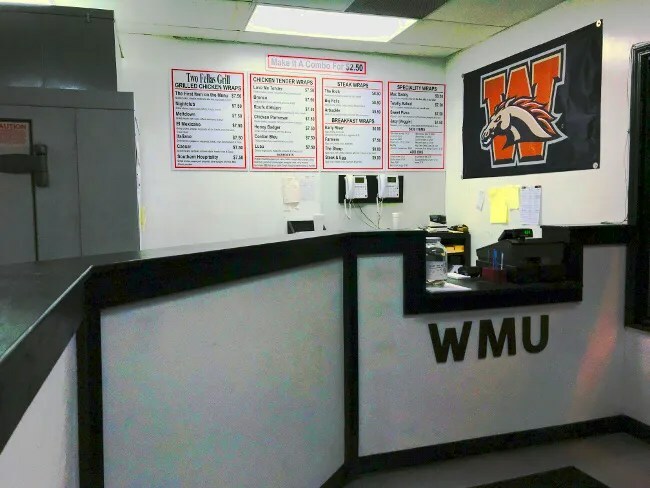 The menu boards hang on the wall behind the cash register. I’ve eaten at their Howard Street location a few times so I was pretty familiar with what they offer. The guys eating their wraps on the bench jumped in with their recommendations as did the two employees working the kitchen. We put in our order for two wraps, fried mac & cheese wedges, and some chicken tenders. I paid the bill, which came out to about $25 before tip, with my card. The small kitchen behind the half wall pumps out all of the walk-in orders. The cook works the flat top and a deep fryer by himself. We were the only ones in there at the time but he had a few delivery orders he had to work on too. He got done with ours and realized he forgot to make J’s wrap so it took a little longer to get our food than it should have but it was still right around ten minutes from order to out the door. We took the food home where we found B still wide awake with Nana at about 10:30. It was pretty late to be eating but it felt like eating after a show is a thing we should be doing. I ordered The Italiano. 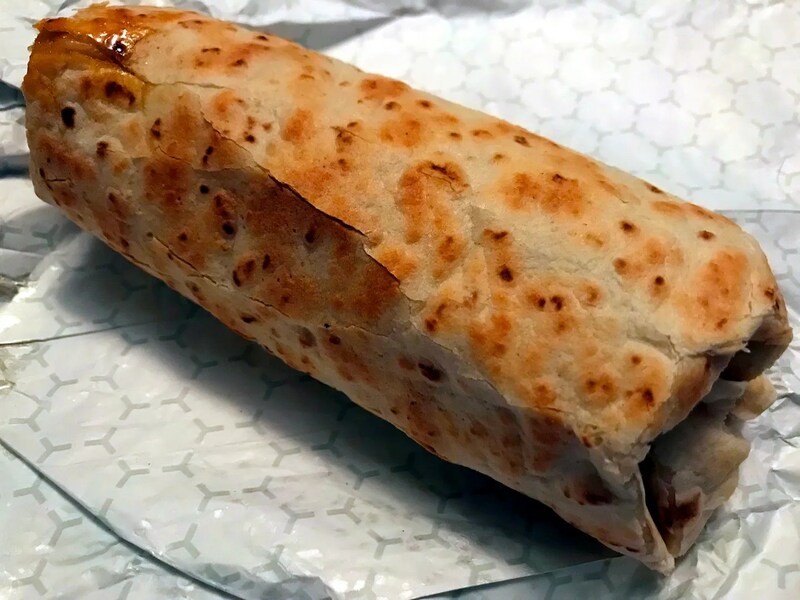 The wrap is a 16″ flour tortilla that is filled until it’s bursting at the seams. You don’t get any sort of side with the wrap but you really shouldn’t need it. 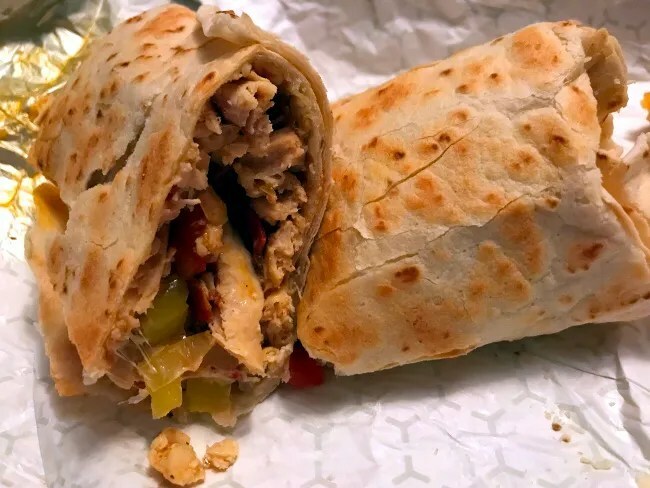 The Italiano is filled with grilled chicken, pepperoni, mozzarella, tomato, onion, banana pepper, and Italian dressing. 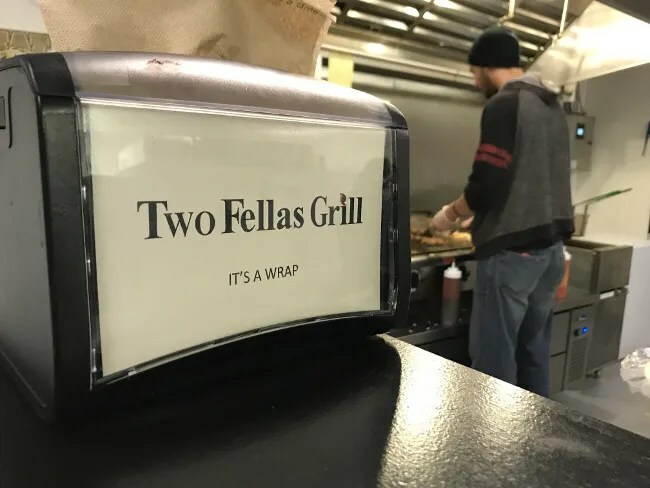 The thing I love about Two Fellas is the wraps are not filled with a lot of lettuce or rice or some other cheap veggie. There is always a good amount of meat and cheese and the veggies compliment all of that instead of dominating it. I normally wouldn’t get the tomato or onion, but I wasn’t paying attention when I ordered and honestly, it didn’t bother me. There was more meat and the Italian dressing dominated the flavor so the onion and tomatoes kind of worked in the background. J’s order was the Honey Badger. This wrap is filled with chicken tenders, mozzarella, honey, and tater tots. That last part is what makes this wrap interesting. Tater tots. They have a couple of wraps with tots in it. Typically, I don’t enjoy tater tots. They never seem to have any flavor, but putting them in the wrap adds another crunch layer to them. They soak up the honey which gives them the flavor they lack. I’ve never had this wrap, but I’ve had others that had tots in them. 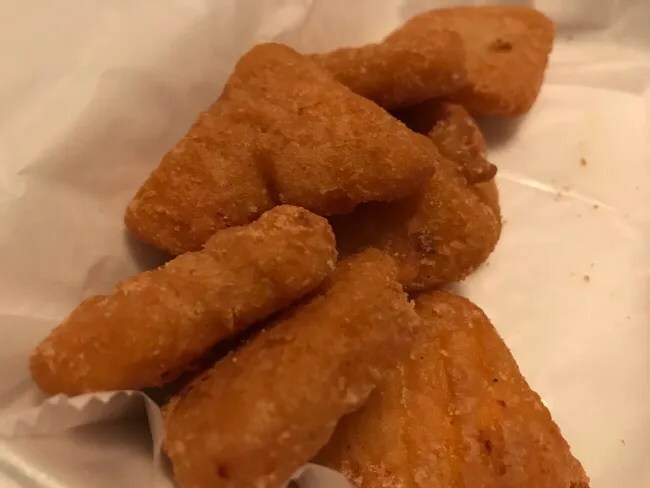 The tots in the wrap are a good idea. L went to town on her chicken strips. She hasn’t been much of a chicken strips kid lately but she was hungry. 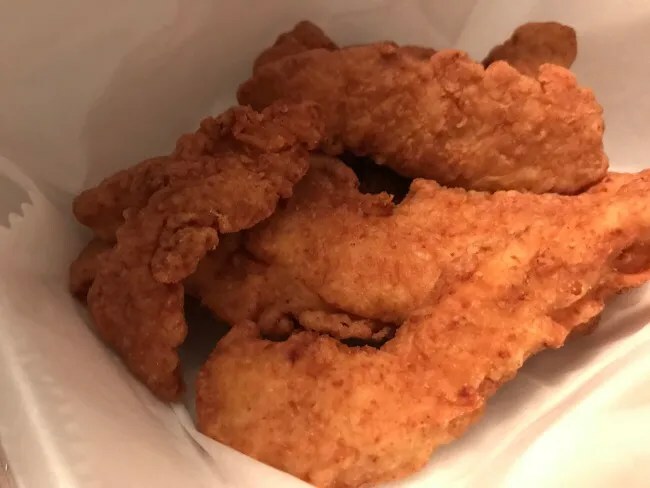 The chicken strips are dumped out of a bag and into the fryer. They’re nothing special but they were cooked to a golden brown crispiness. There were five in the box and I think I ended up eating two of them. The Mac & Cheese Bites came out of a bag in the freezer as well. They’re not an original creation but they are a great side item. There are eight triangle bites in the order. Each one is a crispy outer breading and a creamy mac and cheese in the middle. Depending on how big your mouth is, each one of the triangles is about two bites. 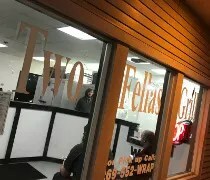 Two Fellas Grill is really good at doing what it does. For the college crowd, it’s really good drunk food. They’re open late and deliver late. 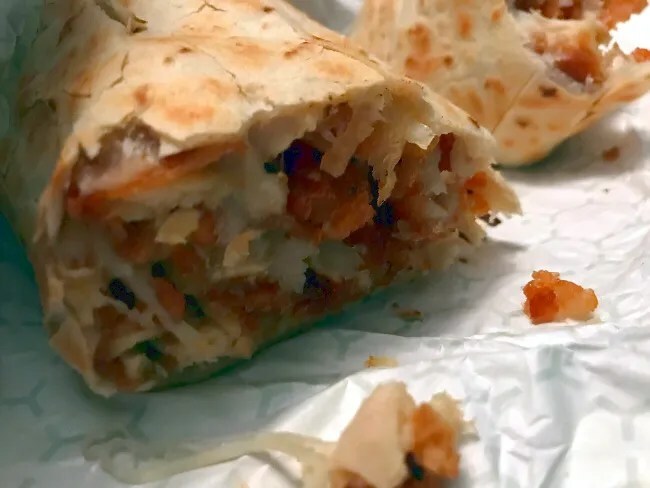 The simple menu of wraps and fried food is just the thing you’re looking for after a night of drinking. For us, Two Fellas Grill is a great alternative to the usual. I love places that are open late. While I call it “drunk food” it’s pretty damn tasty when your sober too. Two Fellas bailed me out many times when I used to get off work at midnight or later.